Rocky Shoes & Boots, Inc.
Donald Trump Signature Modernist Tumi Mens Black Leather CARD Case Wallet RARE!! Tumi Money Clip Card Case (Wallet)- Black - NEW! 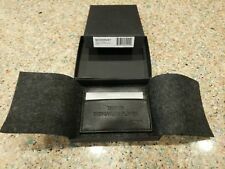 Tumi Leather Bi-Fold Wallet, Black Color ** NEW, NO BOX.